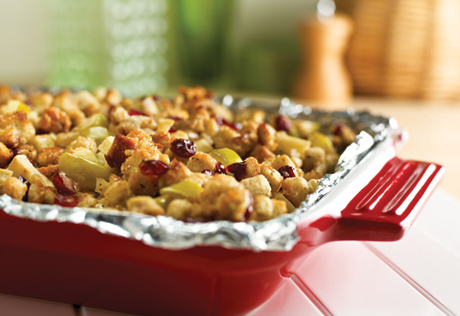 This sweet and savory baked apple cranberry stuffing is the best of both worlds! Sweet apples and cranberries kissed with cinnamon then baked into a warm Thanksgiving stuffing… DELICIOUS! See recipe card for both oven and slow cooker instructions! When the Thanksgiving prep rolls around in this kitchen, I can’t help but employ the tasty stuffing shortcut my mom served up pretty much my entire life. Her ridiculously delicious veggie-loaded stuffing recipe relies on Pepperidge Farm Stuffing Mix as its base and I love it so much that I couldn’t imagine Thanksgiving without it! I was feeling a bit nostalgic when Campbell’s asked me to peruse their massive recipe arsenal over at Campbell’s Kitchen and instantly sought out a new stuffing recipe to whip up. 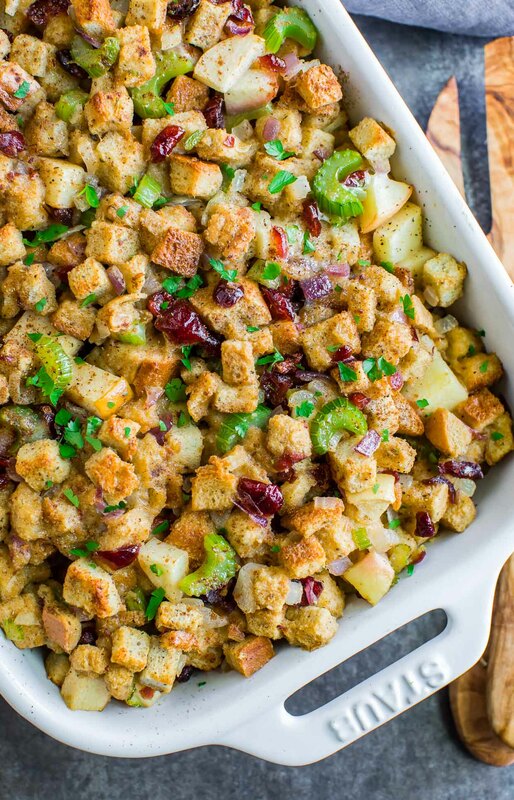 Their baked apple cranberry stuffing is nothing short of AMAZING! I’ve whipped it up a few times now and it has been amazing every which way we’ve tried it. Honey crisp apples have to be my favorite so far, and I’m a huge fan of chopping my cranberries into little bits so I get lots of delicious cranberry flavor in every bite! This scrumptious stuffing recipe yields approx. eleven 3/4 cup servings and tastes GREAT the next day! You can bake this super tasty stuffing in the oven or use the slow cooker instructions at the bottom of the recipe card to make this Crock-Pot style and free up oven space on Thanksgiving! Woot! 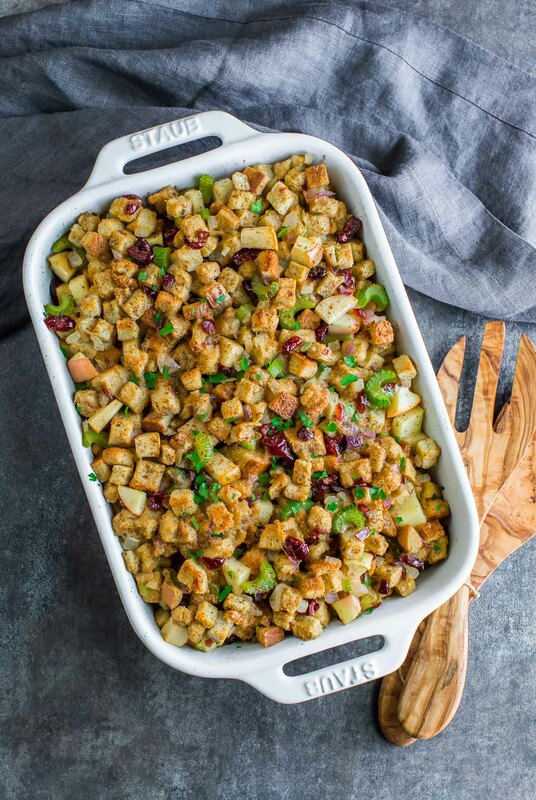 This savory sweet baked apple cranberry stuffing combines the best of both worlds! Sweet apples and cranberries kissed with cinnamon and baked into a warm Thanksgiving stuffing... it's DELICIOUS. Place stuffing mix in an extra-large bowl. Heat butter in a large pan over medium-high heat. Add your chopped onion and celery and sauté until tender and translucent. If you'd like a little crunch in your stuffing feel free to undercook until al-dente. Stir in broth, apple, and dried cranberries and season with cinnamon and black pepper. Whisk an egg, add to bowl, and mix until bread is coated. Adding an egg gives the stuffing a custard-like interior but feel free to skip it if you're going egg-free! 1/4 cup of broth may be used in place of the egg. Bake for 30 minutes or until your stuffing is hot and fluffy on the inside and golden brown on the top. I like to drizzle a little melted butter over my stuffing and garnish with parsley before serving - totally optional but oh so tasty! Lightly butter the inner sides and bottom of a 6 QT Slow Cooker and add your fruit and veggie mixture. Set slow cooker to LOW for 2.5-3 hours. Stuffing may be cooked a bit longer if desired or switched to the warm function while you await dinner! Enjoy! * Feel free to use veggie broth or chicken broth here. ** I've used honey crisp, granny smith, and pink lady apples for this recipe and loved them all! Honey crisp is my favorite if you have one! White, Yellow, and Red Onion all work fabulous for this recipe! My favorite is to use a combination of yellow and red onion. The flavor combo is outstanding. I didn't use salt here since the broth and stuffing mix I use are already perfectly seasoned. Feel free to season to taste as you see fit and if you use plain cubed bread in place of the stuffing mix, season it well with your favorite herbs and spices, as the mix I used was pre-seasoned. Why have I not been doing this all along? AHHH! 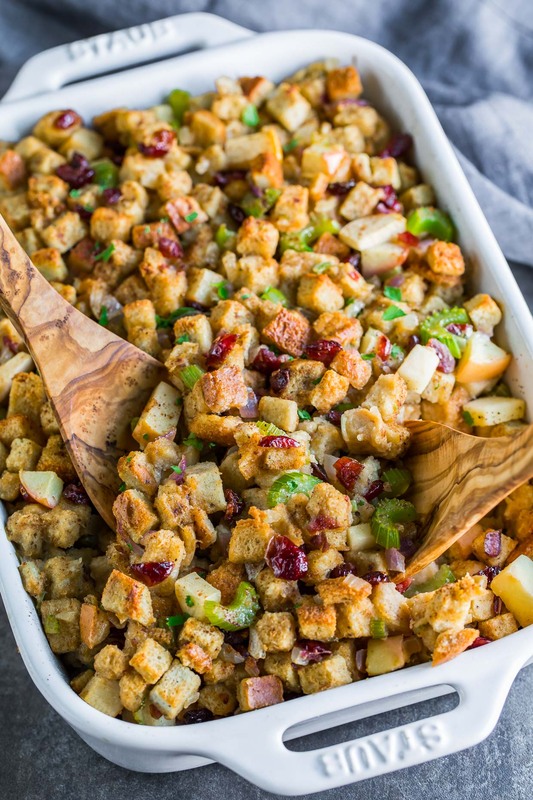 I love love LOVE the addition of cinnamon, apples, and cranberries in this baked apple cranberry stuffing! We seriously cannot get enough of it! The aromatic veggies buddied up with the naturally sweet fruit so effortlessly and flavor was out of this world. I totally get the lure of adding a little sweetness to stuffing now – so good! Some lightly toasted sliced almonds or chopped walnuts might also be super fun added to the mix — I am dying to try that out now too! I think it’s safe to say that I’ve officially broadened my stuffing horizons. It’s also a bit weird to say that… but whatever, it was yummy. 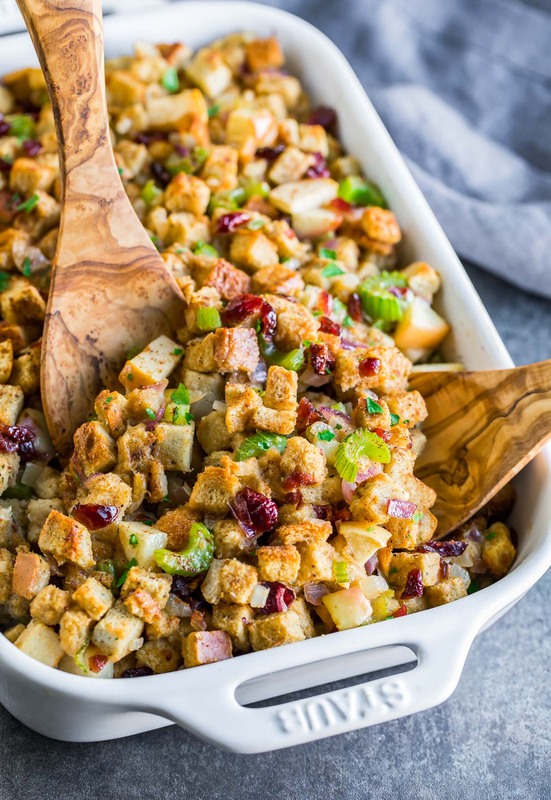 The sweetness of the cranberry and apples in this stuffing make it a perfect pairing for savory vegetables. If you have some leftover the next day, I highly suggest stuffing it into mushrooms, acorn squash, butternut squash, or even atop a hot and fluffy sweet potato! You can also get creative with the leftovers by making a sandwich out of them. My ULTIMATE after-Thansgiving sandwich is piled high with stuffing, crockpot cranberry sauce, and cranberry-walnut cream cheese spread and turkey. You can also make it vegetarian style with all your favorite side dishes. I’ve gone as far as to add mashed potatoes and hot corn to mine and pretty much died of yum! This post was sponsored by Campbell’s Kitchen. 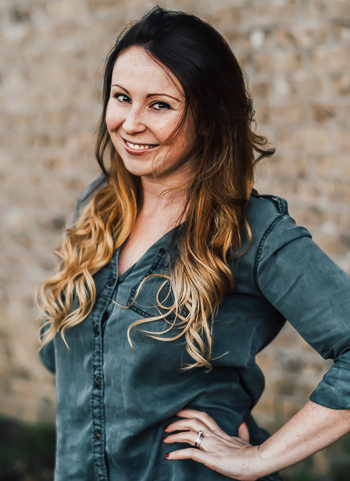 Thanks for helping me keep the recipes free! Can I use fresh cranberries? Yes absolutely! They will be substantially more tart than the dried/sweetened cranberries but still work. I’ve found that roasting them first with a little honey (for approx. 15 min) makes them sweet and delicious! This looks yummy. I’m making this for our Thanksgiving dinner. Just wondering, do the apples need to be peeled? And one other thought, have you ever added honey? Hi Jammie! I’ve made it with peeled and unpeeled apples before and I like it both ways! The skin has extra nutrients and saves you the peeling step so that’s for sure the easier option if you’d like to leave them as is. I haven’t tried honey but the dried cranberries do add a nice kiss of sweetness. Can I use apple juice for the broth? Hello there I was wondering if I could prepare this in advance and then pop it all in the crock pot when im ready? Snag the recipe above and complete steps 1 through 4 (save the broth for the next day so the veggies don’t soak it all up and get mushy). Remove from heat and allow mixture to cool. Place in an airtight container in your fridge. When you’re ready to make your stuffing the next day simply add it to the slow cooker with the remaining ingredients and set it to low for 2.5-3 hours. SO EASY! Yes of course! Just make sure everything is the correct temp. before eating and you’re good to go 🙂 If the turkey is finished (165 degrees F) and the stuffing still needs more time, you can scoop it out into a casserole dish and let it finish baking while you let the turkey rest and carve it up. Hope you have a Happy Thanksgiving! I’ve been making stuffing very similar to this for many years. I like to use a sweeter apple like gala because the cranberries can be quite tart. I saute onions and celery in butter until almost tender. I also add walnuts or pecans along with the apple and cranberries. Then I stir in a box of Stove Top Stuffing Herb flavor and add a bit more flavor with Bell’s Seasoning. I used to dry my own bread but Stove Top tastes just as good. I use chicken broth for the liquid. I pile it into a casserole dish and drizzle butter over the top. Cover it and bake for about 30 min then I take the cover off for the last 15 min. or so. We like it a little crispy on the top. Can we use fresh cranberries for the Apple and cranberry stuffing or would that make the taste different? Cooking for someone who can’t eat onion…I wonder if onion powder would give some of the onion flavor? I think it’s worth a try if they can have onion powder without issue! I’m not sure why I didn’t see this until right now. I really can’t explain it. BUT HOLY MOSES, this is going to happen. Once again, you’re a brilliant mind! Campbell’s soup reminds me so much of my childhood! Chicken noodle and tomato soup [with a side of grilled cheese] were my favorite “sick” foods 🙂 Stuffing is my favorite Thanksgiving dish and always wonder why we don’t make it any other time of the year… That needs to change! we’re deep frying this. oh yes we are. I love making homemade stuffing with apples and cranberry, and about a pound of breakfast sausage – it’s so delish! I love putting apple and cranberry in my stuffing, too. Sweet and savory! This looks too good. This sounds amazing! I love stuffing but only seem to eat it in November, which needs to change! If it was acceptable to eat stuffing every day, I totally would! This looks delicious! Hallelujah- that looks like Thanksgiving! This stuffing looks incredible on that sandwich!! Yummm! This looks and sounds delicious. I’m making stuffed mushrooms tonight and might just have to give this recipe a try! This looks fantastic! I will keep my eye out for the Stuffing package on my next grocery trip. I don’t think I have ever seen it before. It’s usually in the rice/grain aisle I think? I love it so! I’m with you, Jenn, I always think of soup first. This sounds really good, though! Right?! Who knew!? Thanks girly!